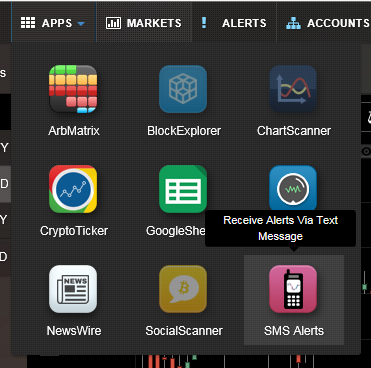 Coinigy allows users to set up SMS alerts. To get started with SMS alerts, you first need to set up an alert on your account. Once you have done that, find the 'SMS Alerts' app in the 'Apps' drop-down menu in the top left side of the screen. From this page, follow the steps by entering your phone number and confirming it by entering the code you are sent a text message. 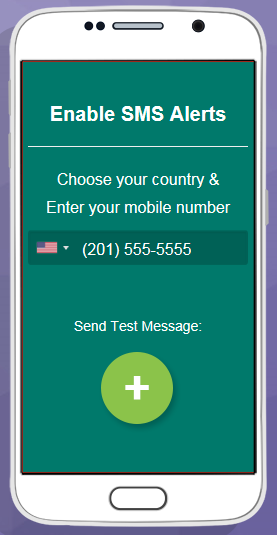 Once you have confirmed your phone number, your SMS alerts will automatically be switched on and you will be notified of any alerts triggered for your Coinigy account. Coinigy users get 5 dollars USD in SMS credit per month. You will receive a notification when you have about 10 messages worth of credit remaining. If you use up your credits rollover credits will be used. You can add SMS credits or estimate the number of messages $5 can send by clicking "Click to add credit"
If you wish to switch SMS alerts off, visit the notifications page found in the drop-down menu under 'Settings' in the top right of the site and uncheck the respective boxes.